Employers have a duty of care to their employees. That extends to when they are working on their own, either on your premises or visiting clients. While many companies seek to protect their lone workers out of a desire to be good employers, there is also the formidable financial penalties that can be levied by the Health & Safety Executive (HSE), which are set in proportion to the offending business’s turnover and could run into millions of pounds for a large company. Don Cameron, CEO of StaySafe, adds that many companies that purchased first-generation lone-worker solutions are returning to the market to buy replacements to the extent that they make up roughly a third to a half of its sales. He says new sectors have started to come into the market in addition to the early adopters (such as housing associations), driven in part by seeing their peers starting to use lone-worker systems. So, what does a company need to consider when procuring a lone-worker protection system? Cameron says the best starting point is to consider what their employees do in the field and the associated risks. For example, a social worker in London and a telecoms engineer in Cumbria who climbs masts face very different risks. The former has a need for a discreet panic alarm, while in the case of the latter, “it’s probably much more important to have things like fall detection”, also known as man down. Will Murray, chairman of the British Security Industry Association (BSIA)’s lone-workers section and marketing director of The Send For Help Group, adds that cellular coverage is another important consideration, but its absence (for workers in remote areas) can be addressed with the use of satellite-phone-technology-based devices, which also use GPS, using one satellite system to pinpoint the user and another to transmit the alarm to the monitoring centre. Murray says the next step down would be an employee who travels widely as part of their job, and their need for coverage could be met with a product that uses roaming sims to ensure that it can connect to the mobile network with the strongest available signal. Staying on the topic of coverage, but focusing on lone-worker apps, StaySafe’s Cameron says one way of mitigating against potential coverage blackouts, such as a tower block that an employee might be visiting, is for them to enter detailed notes on the app prior to entering the location, which will then be instantly available to any responder in the event of an alarm. He adds that in the case of the StaySafe app, his company has done a lot of work to allow it to function in areas of low or no signal. In the case of the former, it will operate in areas where only 2G is available. In no-signal areas, the check-in functionality will still trigger an alarm when a pre-determined check-in is missed, and the operator is presented with the last known location and notes left by the user, ie, ‘I’m working in the plant room’s sub-basement’. The BSIA’s Murray adds that if the employee regularly travels internationally, the SIM needs to be configured accordingly, and if an alarm is raised abroad then the people handling the response will need to be able to deal with that country’s emergency services and speak the appropriate language. Murray also highlights the need to factor in the device’s exposure to the elements – if the employees will often be working outdoors, then buyers must select IP-rated devices, which offer protection against dust and water ingress. Similarly, devices capable of being dropped without breaking will be needed for construction sites and similar locations, while sites where potentially explosive gases may be present will require ATEX-rated devices. Both Cameron and Murray say there is currently little demand for integrating lone-worker systems with Bluetooth beacons for accurate in-building location detection. Cameron adds that one of the biggest barriers is that they require the client to own the building and are only required when it is important to know “exactly what room [employees are] in or what platform they’re on… 99 per cent of the time, the standard GPS positioning combined with Wi-Fi, combined with cell tower triangulation, meets the requirement”. The escalation path of the alerts must be considered, starting with the organisation that will be the first to respond to an alarm. In the case of the social worker, they will be best served with a device or app that is connected to a 24/7 call centre that can escalate the alarm straight to the police. In this scenario, the BSIA’s Murray says “adhering to the [BS8484] standard really does make a difference in terms of the speed of response because it allows you to apply to police forces for a unique reference number (URN)”. He explains that when alerts are passed from a BS8484-compliant alarm-handling centre using a URN to the police, “it works out to be about two minutes quicker on average than ringing 999, which can [be the difference] between life and death”. If the first people who are likely to be able to respond are other employees who are also on site or nearby (as may be the case with large industrial sites), then a different approach could be called for. Matt Wright, CEO of GlobalView Systems (GVS), notes that while there is a move towards using smartphone-based systems, on certain sites such as petrochemical plants, which may also have poor cellular coverage, employees are far more likely to have two-way radios than smartphones. He adds that while many two-way radios come with some lone-worker/man-down functionality, there is a need to go further, given that an employee could decide to avoid having to regularly check in by turning off their radio, and the need to have the necessary evidence to show that if an incident did occur that the employer was doing everything in their power to prevent it. Wright says GVS’s system generates lone-worker management reports that state among other things whether the equipment is working on that day and whether someone has powered their radio down. He adds that the interval between the lone-worker prompts on a two-way radio can be adjusted to fit each user’s circumstances. Similarly, the reporting function allows the employer to build up a picture of how the system is used over time, so they can identify employees who might need more training or instruction. Wright adds that it is also possible to geofence dangerous areas so that if an individual with a two-way radio enters them, they are automatically placed in lone-worker mode. 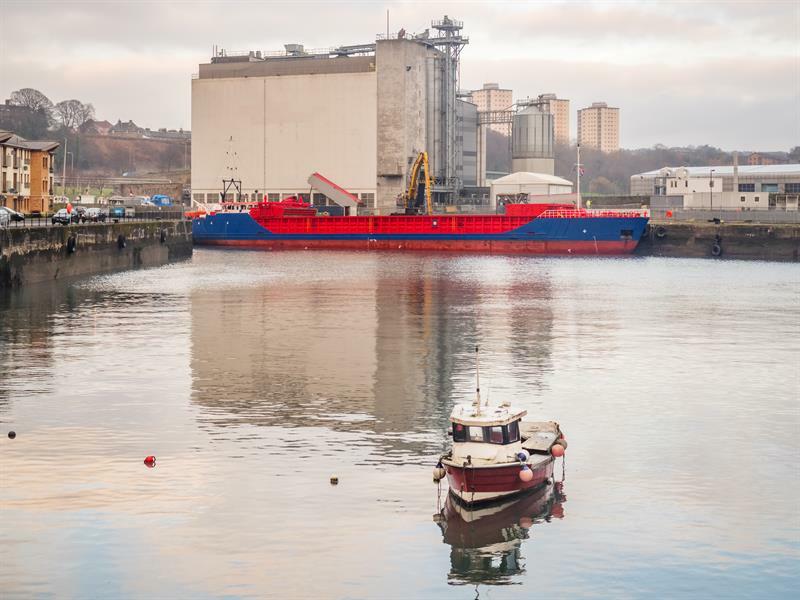 GlobalView Systems installed a lone-worker system for a grain storage facility in Scotland that is a large site and needed the ability to locate workers’ positions within it to allow their colleagues to respond quickly to any incident. While location tracking is currently done with GPS, the site is moving towards Bluetooth Low Energy (BLE) beacons, which will update employees’ locations every 30 seconds. The power and locations of the beacons are being fine-tuned so they provide the correct level of resolution and don’t indicate that someone is in a particular shed when they are just walking past it. Before the involvement of GVS and the site’s radio reseller, it was using PMR446 radios, but the workers couldn’t speak to each other within some of the vessels they were unloading, creating a huge risk for lone workers. The cellular coverage was poor, so licensed two-way radios were chosen for lone-worker protection. StaySafe’s Cameron says when it comes to lone-worker system procurement, “people really need to focus on ease of use”. After all, if they don’t use it then “it’s a wasted investment”. Another reason to opt for intuitive-to-use systems is that they require minimal training and address the needs of some employees who may go several months between uses. He adds that “frankly, we don’t see people focusing on [ease of use] much in formal procurements”. Murray highlights the need to get employee acceptance, for example by speaking to departmental managers, their team members, HR and senior management, at the beginning of the process, emphasising that it is in their best interests and keeping them involved during the procurement. He adds that there can be pushback from unions as they may fear that the solutions are being used as “a Big Brother tool”. However, GVS’s Wright says in one case, complaints from unions regarding the lack of protection were what prompted an organisation to start procuring a lone-worker solution. Murray recommends that a company should trial a lone-worker solution before signing on the dotted line, and this should involve all the relevant stakeholders to get their buy-in, along with the use of feedback forms at the end of the trial. Once the device or app has been purchased, he highlights the importance of training, as “[the system] is only as good as the [user’s] knowledge of how to use it”.He says that while “some organisations prefer to go for a train-the-trainer system or have super-users”, he always encourages them to bring the end-users to the training sessions. Murray also recommends regularly performing test alarm calls and checking that all the pre-registered information on a user is up to date. StaySafe’s Cameron says it is important to explain to employees why the employer is investing in the solution – “ultimately it helps ensure that you get home safe to your family” – and that this kind of messaging needs to be continually reinforced, for example by sending messages to employees who haven’t used the system in a while. Murray adds that some clients mandate the use of lone-worker solutions to the point where non-use (logged by the management and usage reports) results in disciplinary measures. “It’s a bit of a stick approach, but at the end of the day, it’s trying to help end-users help themselves, because you just don’t know when an incident is going to happen, and prevention is better than cure,” he says. One piece of regulation that has to be factored into the procurement of lone-working solutions is of course GDPR (General Data Protection Regulation), but its impact has been relatively low, as StaySafe’s Cameron explains. “We had to do some [extra] development to cover all the ‘right to be forgotten’ elements of GDPR legislation,” he says, but much of the data protection and privacy procedures and policies required were already in place, either because they were best practice or had already been mandated by BS8484. He adds that GDPR has changed companies’ approach to lone-working solutions procurement in that “everybody now asks you about GDPR whereas historically a relatively small proportion asked you about data protection – it’s raised the profile of that quite dramatically”. One dilemma, especially for those not issued with two-way radios or PTT over Cellular (PoC) devices, is the choice between a dedicated lone-worker device and a smartphone app. Murray says that generally, “apps are much more appropriate for lower-risk users”, giving the example of travelling salespeople who would rather not carry and charge an additional device on top of their personal and company mobile phones. Cameron says one factor that has recently increased the suitability of apps for high-risk, public-facing staff is the availability of wearable, Bluetooth-tethered devices that allow users to discreetly trigger an alarm without reaching for their smartphone and can also have man-down functionality. He also highlights the simplicity with which apps can be updated and their ease of use. StaySafe offers devices “because we recognise that in some cases, people just don’t have smart mobile phones, and where they don’t have that, a device may be more suitable”, but it focuses on the app “because we believe it’s a much stronger solution”. From what we’ve heard, if you carefully consider all your employees’ lone-working needs, trial multiple solutions, keep everyone involved throughout the procurement process, while also paying attention to both training and ongoing engagement, you will be well on your way to protecting your most vulnerable workers.